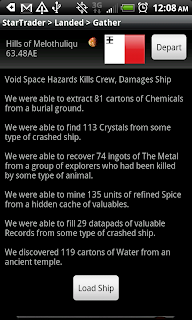 We are constantly impressed by the reports of people's successful Captains in Star Traders RPG. The creators of the game often struggle to pass level 12 and we are hearing reports of players with captured Flagship Cruisers and Level 50 Captains. So, please -- keep sending us your reports. We don't know how you're doing it but it would be nice to know -- I would like to use your techniques!! !